Percussion music consists of definite pitched and non-pitched indefinite percussion instruments. Distinguishing between these two types of instruments is simple when you know what to listen for. A definite percussion instrument will produce pitches capable of notation by a competent musician. Non-pitches indefinite instruments do not produce sounds that lend themselves to accurate notation; rather, the pitches are spaced in the staff based on their general pitch. Indefinite instruments with high general pitches appear at the top of the staff and low instruments such as the bass drum appear at the bottom of the staff. Mallet instruments typically do not fall into the category of indefinite pitched instruments. The majority of them, including the xylophone and marimba, have defined pitches. However, some instruments that use mallets to create their sound do classify as indefinite pitched instruments. Steel drums and roto toms both use double mallets to play and create pitches of varying indefinite pitch. Metal instruments fall almost entirely into the category of indefinite percussion instruments. Several instruments use brushes, drum sticks and beaters to create sound. Cymbals come in several sizes from four inches to large 18-inch concert cymbals. The triangle is a familiar instrument using a metal beater to strike the instrument. Additionally, there are cowbells, anvils, wind chimes, sleigh bells and thunder sheets. Any instrument that is made of metal and requires a beater or brush to create sound is considered a metal instrument. Most people think of drums when referring to indefinite percussion instruments. 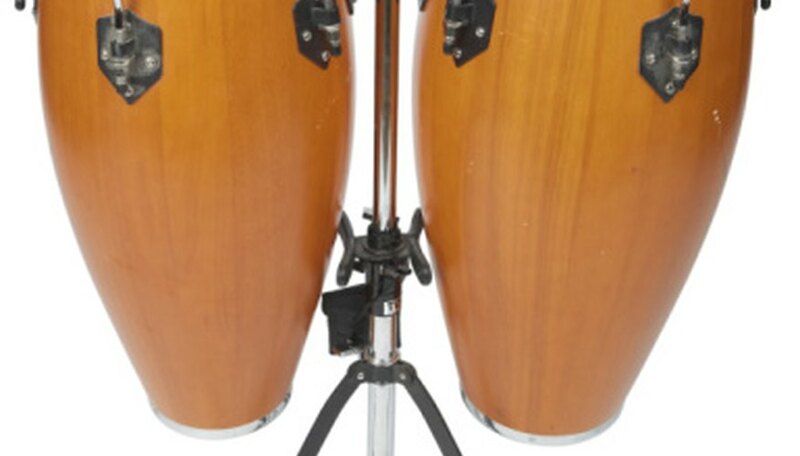 The most common drums are the snare, which has a metal wire underneath the drum, the bass drum, which produces booming low notes, and the bongos, which a player hits with his hands. In addition to these commonly used instruments, the tenor drum resembles a higher pitched bass drum. The Lion's Roar is a modified bass drum with a cord pulled through a hole in the center of the drum. It was used in the 1975 movie soundtrack “The Wind and the Lion” by Jerry Goldsmith. Wood blocks, temple blocks, claves and the guiro are all commonly used instruments that produce indefinite percussion sounds. Most people are familiar with wood blocks and claves and they are very similar instruments consisting of two blocks of wood struck together. Temple blocks originated in China and contain a slit in the top of a wooden block that is hollow in the center; percussionists strike the block with a wooden beater. The guiro is a Dominican instrument that looks similar to a fish with ridges. A wooden stick scrapes the side of the instrument to create sound.